Prime Minister of Mauritius Pravind Jugnauth on January 24th took a holy dip at Sangam at Prayagraj Kumbh and offered his worship to Lord Hanuman. His wife, Kobita Ramdanee was also with him. While many thought that this was due to the fact that PM Jugnauth is a Hindu and comes from a Hindu-majority Mauritius, now Chief Minister of Yogi Adityanath has disclosed that this also had a lot to do with the pride of India and her people. 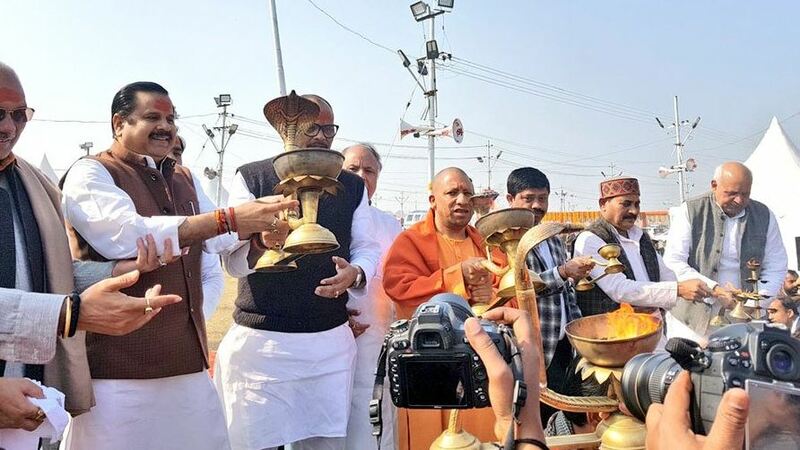 Yesterday, for the first time in the history of Kumbh, UP State government’s cabinet meeting was held at Prayagraj Kumbh. Chief Minister Yogi Adityanath chaired the meeting. 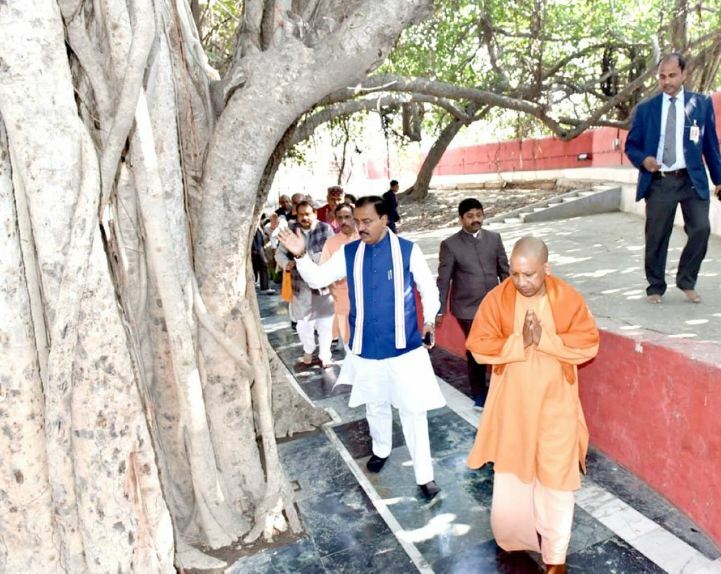 Before attending the cabinet Yogi worshipped at Hanuman Temple at Sangam and visited Akshya Vat. Most of the UP Cabinet Ministers including both Dy Chief Ministers Keshav Prasad Maurya and Dr Dinesh Sharma attended the meeting. 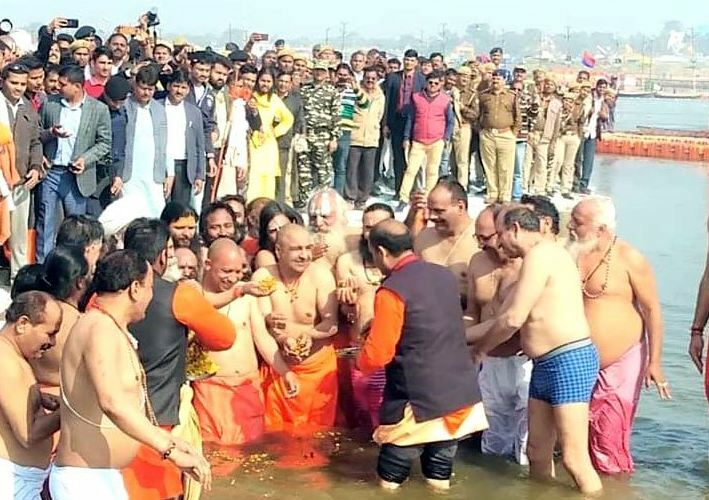 After cabinet, Yogi took a holy dip at Sangam the confluence of rivers Ganga, Yamuna and mythical Saraswati along with his cabinet colleagues and visited his sect of Nath to meet saints and seers. Uttar Pradesh State cabinet decided to construct 600 km long Ganga Expressway from Meerut to Prayagraj with a cost of rupees 36000 crores to provide better connectivity from Western districts to Prayagraj. Yogi said that his cabinet has also approved proposal of Gorakhpur link road project connecting Azamgarh and Ambedkarnagar with Purvanchal expressway. He said 5555 crore rupees will be invested on the link project. Yogi also announced that Cabinet has also decided to exempt film URI from State GST as film is based on patriotism and sacrifice of soldiers. Yogi was accompanied with both Deputy CMs and several other cabinet colleagues. Talking to media persons UP CM Yogi Adityanath extended his government’s gratitude to Prime Minister Narendra Modi and Union government for extending great cooperation in organising Divya and Bhavya Kumbh at Prayagraj. He said undisrupted flow with clean water of river Ganga is results of attempts and inspirations of Prime Minister Modi. He said in 2013 Kumbh at Prayagraj then Mauritius Prime Minister had visited the Prayagraj Kumbh but he did not take holy dip due to pollution in the river Ganga but this year not only Mauritius PM took holy dip but more than 3000 Pravasi Bharatis also took holy dip during Kumbh. He said it has happened only due to cleaning of river Ganga. In short, the dip of PM of Mauritius showed that significant places and practices of Hindu faith are safe, well-taken care of and also ready to host more devotees. What happened in 2013, is, now, just part of history.